In 1937, celebrated aviator Amelia Earhart embarked on her second attempt to circumnavigate the globe—and on July 2, she and navigator Fred Noonan vanished while flying over the Pacific Ocean, en route to a largely uninhabited coral atoll called Howland Island. To this day, Earhart’s fate remains a mystery. But over the years, experts and conspiracy theorists alike have come up with numerous theories to explain her disappearance. Here's a small sampling of them. 1. EARHART'S PLANE CRASHED AND SANK INTO THE PACIFIC OCEAN. Many experts believe that Earhart’s Lockheed Model 10 Electra never arrived on Howland Island because it ran out of gas, crashed, and sank in the Pacific Ocean. The aviator’s world flight began in Oakland, California, on May 21, 1937, and on June 29, she and Noonan reached Lae, New Guinea. A few days later, the duo embarked on the journey’s third-to-last leg: a 2556-mile nonstop flight to Howland Island, a tiny coral atoll in the South Pacific. There, they planned to refuel before traveling to Hawaii, and then California. At 6:14 a.m. on July 2, Earhart and Noonan’s plane made radio contact with U.S. Coast Guard cutter Itasca, which sat off the coast of Howland to provide Earhart with radio navigation, communication support, and a smoke plume. Earhart reported that they were only 200 miles away—but around 7:42 a.m., she contacted the Itasca again to say they were running low on fuel and couldn’t spot land. Communication was spotty, and Earhart couldn’t hear most of the Itasca’s replies. The plane radioed the ship several more times—the last time at 8:43 a.m—before losing all contact. Earhart's last, garbled message is thought to have said, "We are on the line 157-337... We are running on line north and south." Today, many parties—including the U.S. government and experts at the Smithsonian Institution’s Air & Space Museum—say that the plane likely ran out of gas and plunged into the ocean, killing both Earhart and Noonan. Earhart and Noonan were officially declared lost at sea on July 19, 1937, following a widespread sea and air search involving 4000 crewmen, nine vessels, and 66 aircraft. In recent years, Nauticos—a company in Hanover, Maryland that performs deep-ocean searches—has looked for Earhart's plane, but their efforts have yielded no findings. 2. EARHART WAS A SECRET SPY WHO SURVIVED THE VOYAGE AND LIVED HER FINAL YEARS IN HIDING. In his 2016 book Amelia Earhart: Beyond the Grave, author W.C. Jameson builds on one theory that Earhart wasn’t simply a pilot: She was also a spy, hired by President Franklin D. Roosevelt to monitor Japanese military installations on the Marshall Islands. According to Jameson, Earhart’s plane was outfitted with cameras. However, the pilot’s surveillance mission didn’t go as planned: She was shot down by the Japanese, or captured in the Marshall Islands after she crashed or made a forced landing. According to the theory, Earhart was liberated in 1945, and she returned to the U.S., changed her name to Irene Craigmile Bolam, and lived undercover as a banker in New Jersey. In 1982, Bolam—a.k.a. Earhart—died. Variations of this theory are posited in several other books, including Amelia Earhart Lives (1970), written by author Joe Klaas with the help of Joseph Gervais, a former Air Force major. Gervais met Bolam while meeting with a group of aviation enthusiasts, and became convinced that she looked just like the missing pilot. After investigating Bolam's life, Gervais claimed in Klass's book that few public records existed to support her accepted identity, and that she was, in fact, Earhart in hiding. This theory was widely debunked, and Bolam called it a "poorly documented hoax." She filed a $1.5 million lawsuit, and the book's publisher, McGraw-Hill, pulled the book off the market. The case was reportedly settled out of court. As for the so-called "resemblance" between Bolam and Earhart, people who have compared photos of the two (including a criminal forensic expert hired by National Geographic) say they aren't the same person. 3. EARHART WAS CAPTURED BY THE JAPANESE, AND SHE DIED AS A PRISONER. Some people say that Japanese forces apprehended Earhart and Noonan—perhaps as spies, or simply as stranded crew members—either on the island of Saipan in the Northern Mariana Islands or in the Marshall Islands. They eventually died in captivity. Several books propose variations of this theory, including Fred Goerner's The Search for Amelia Earhart (1966). Goerner posits that that Earhart and Noonan crash-landed on Mili Atoll in the Marshall Islands. Natives are said to have seen Earhart’s aircraft land, and to have helped the Japanese remove it and ship it to Saipan, nearly 2000 miles away. As for Earhart and Noonan, they were captured alive and sent to Saipan, where they died as prisoners. Recently, Parker Hannafin Corporation, a motion control technologies company, funded search efforts in the Marshall Islands, where search and salvage nonprofit Amelia Research, Inc. had found pieces of metal believed to have come from Earhart’s plane following its crash. The results of the expedition haven't been announced. 4. EARHART DIED AS A CASTAWAY. Some people believe that Earhart and Noonan, unable to locate Howland Island, searched for another island to land on. The duo ended up making it to Nikumaroro (also known as Gardner Island) in the Pacific republic of Kiribati, which lies some 350 miles southeast of Howland. There, they radioed distress calls for days until their plane was swept away by the tide. Earhart (and presumably Noonan) both died as castaways. The leading proponents of this theory are the members of a nonprofit group called the International Group for Historic Aircraft Recovery (TIGHAR). Led by executive director Richard Gillespie, they've spent decades investigating Earhart’s last flight, and have traveled to Nikumaroro Island multiple times since 1989. 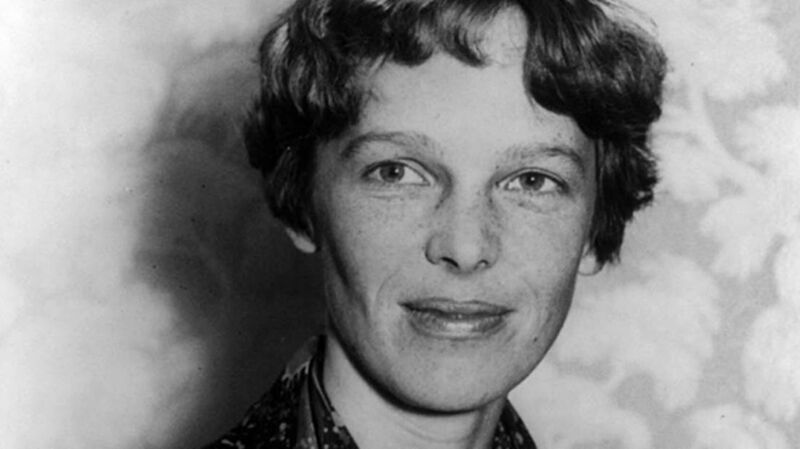 Their expeditions have uncovered artifacts including leather shoe parts, fragments of a jar that may have been freckle cream (Earhart had freckles), and Plexiglas and aluminum fragments. Recently, TIGHAR made headlines when they announced that a new analysis of bones discovered on Nikumaroro in either 1939 or 1940 may support their castaway explanation. The 13 bones—including a skull, a humerus, and a radius—were found along with the sole of a woman's shoe, an empty box that may have once held a sextant, and other debris. Long ago, a doctor named D.W. Hoodless determined that they belonged to an elderly man, and over the decades, the partial human skeleton was discarded. But in 1998, TIGHAR re-examined the bones’ recorded measurements, and claimed that Hoodless was wrong: They actually belonged to a woman with the same stature and ethnicity as Earhart. In the latest round of speculation, a forensic imaging specialist named Jeff Glickman analyzed photos and the original skeleton measurements and noted that the skeleton’s forearms were particularly long, just like the missing pilot’s. However, many experts have dismissed these new conclusions, saying they—along with TIGHAR's other theories—aren't strong enough to confirm Earhart's fate. Dorothy Cochrane, a curator at Smithsonian's National Air and Space Museum, even told Smithsonian magazine that "Gillespie's theory is based on conjecture and circumstance. He repeatedly ignores facts such as the found sole of a woman’s shoe being the wrong size for Earhart—a fact stated by her sister." Even the identification of the skeleton as female is in doubt. In 2015, a different set of researchers noted flaws in the 1998 paper and came to the conclusion that the original male classification was more likely. 5. EARHART'S PLANE CRASHED IN PAPUA NEW GUINEA. In 1945, a group of Australian World War II soldiers on the island of New Britain, in Papua New Guinea, reportedly discovered civilian aircraft wreckage in the jungle [PDF]. A reconnaissance patrol map from that mission names the plane’s construction number—C/N 1055—which matches the one on Earhart’s own aircraft. Its engines also resembled the ones on Earhart's Lockheed Electra. David Billings, an Australian aircraft engineer who lives in Papua New Guinea, reportedly owns video testimonies of the discoverers, and to this day, a patrol member’s widow safeguards the map. That being said, Earhart was supposed to land on Howland—not New Britain—so Billings theorizes that she may have turned around while en route to Howland and flown hundreds miles to find another island. However, many people say it’s unlikely, as this theory contradicts Earhart’s final radio messages. Plus, they argue, her plane was too low on fuel to make the journey. These arguments haven't stopped Billings and other believers from trying to prove their theory: In 2012, they launched a crowdfunding campaign to fund an expedition to search New Britain's jungles for the downed aircraft, but it didn't meet its goal amount.